These fun complete the picture puzzles themed around space give children plenty of practice at observation, copying and drawing skills. Some are harder than others so you can choose the correct level for your children. 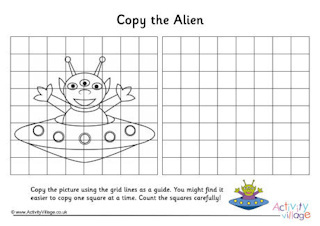 Can the kids finish the top picture of the alien in the flying spaceship by copying the missing parts with reference to the bottom picture? This printable is a mixture between a puzzle and a drawing activity! The challenge for the kids is to complete the picture of the earth on the left by filling in the missing parts with reference to the picture of the earth on the right. Children will need to use their observation and copying skills to complete the first picture and make a full moon! Have a go at this complete the picture puzzle of a planet, filling in the missing parts of the grid by referring to the complete picture on the right. It might be quite a challenge! There are big chunks missing from this planet and its rings! Can the kids carefully copy the picture underneath and complete the planet picture on top? Help get this shuttle ready for blast off by completing the picture using the bottom illustration for reference. It'll take some careful observation and copying skills! Our fun sun complete the picture puzzle asks children to fill in the missing parts of the picture by copying the complete sun on the right. It takes a fair amount of concentration to get everything to match up!